The Nshongi gorilla family is one of the twelve habituated gorilla families that are found in destination Bwindi explored on gorilla safaris in Uganda. The Bwindi Impenetrable National Park is the largest mountain gorilla habitat not only in Uganda and the region but also at the international level. Nshongi gorilla family with a count of eighteen (18) members features a considerable rich history basing from its status of being the largest group of mountain gorillas ever been habituated. The travelers planning to take gorilla trekking safaris in Uganda are always taken by the writings about Nshongi gorilla group prompting them to develop immense desire to track it once they are in Uganda. Positioned in Rushaga to the Bwindi south another region in Bwindi where gorilla trekking in Uganda is also conducted, Nshongi gorilla family is part of the five gorilla groups that mark the area. Being the founding family and the base for these other gorilla families of Mishaya, Bweza, Busigye and Kahungye, Nshongi gorilla group is very respected and historical. The Nshongi gorilla group at the time of habitation had over 36 members and the intense habituation experience saw the group introduced for tracking in the month of September the year 2009. The group derives its name from Nshongi river where it was first spotted. 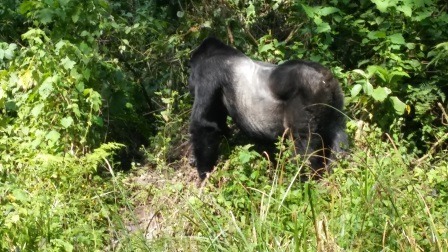 The male Silverback took over the name Nshongi and maintained the dominancy of the group. Like many gorilla groups of its caliber, the Nshongi gorilla group could not hold together anymore beyond July 2010 when the Mishaya Silverback decided to separate to form the Mishaya gorilla family that is apparently explored on Uganda gorilla safaris reducing the former group to 26 members. The separation of Mishaya opened the doors for other members and in the year 2013, the Bweza Silverback also separated to establish the Bweza gorilla group with a count of 10 members which reduced the Nshongi group to the 18 member status. Tracking Nshongi gorilla group on gorilla safari in Uganda requires you to buy the Uganda gorilla permit for Rushaga region from the Uganda Wildlife Authority standing at $600 for the foreign nonresident and the $500 for the foreign resident and then 250,000/= for the citizens of the member states of the East African community and its encounter commences from 8am at the park headquarters and the duration may range from 2 – 8 hours depending on the gorilla movements. Interestingly, the gorilla group thrives in verdant vegetative region that offers chances for exploring other Primate species, butterflies and a myriad of birds.